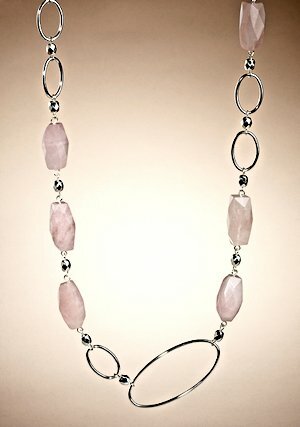 This necklace by fashion designer Adrienne Vittadini features *huge* genuine rose quartz faceted gemstones and silver plated ovals and beads. It has a lobster claw closure (which means you can wrap it a bunch o' times and make a *killer* choker) and is approximately 44" long. The matching earrings are also available. Guaranteed authentic, 1 available.